Science is one of the most fun homeschool subjects to teach my sons. Our family is pretty science-focused but we prefer an unschooling approach to learning science. There’s just so much to explore and each child has his individual interests that we want to follow. I make my own homeschool curriculum, but often the science portion includes planned lessons and impromptu lessons that come about when one of the boys asks a science-related question and we dive in head-first to find answers. 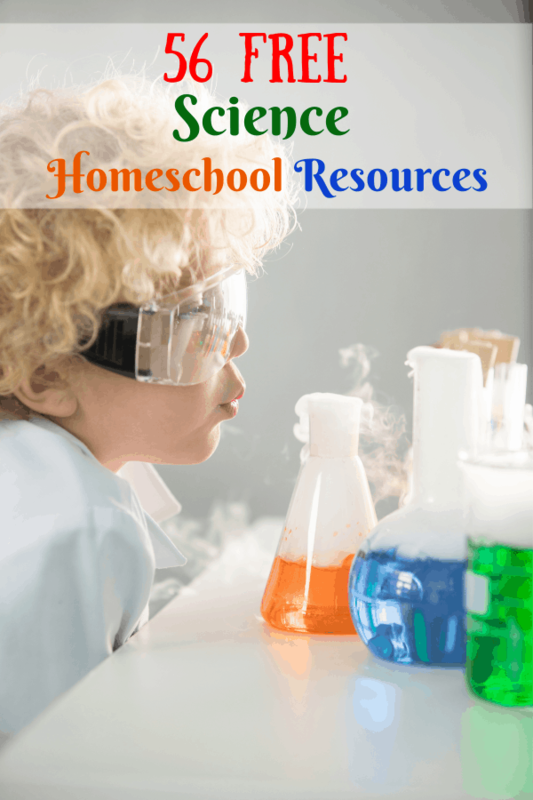 Over the years I’ve compiled a large list of free homeschool science websites that offer lessons, worksheets, games, videos and more to keep my science-loving guys filled up with science concepts. I’m excited to share my favorite resources with you! Be sure to check out my list of 56 free homeschool math resources, 56 free homeschool reading resources, 56 free homeschool social studies resources, and 56 free homeschool language arts resources. 1. Free 12-page set of printables on the Periodic Table. This is a brilliant resource from Five Js, a wonderful website for homeschooling materials. Page 1 is full-color periodic table. Page 2 gives an alphabetical list of the elements. Page 3 is a black and white, filled in periodic table. Pages 4-5 are blank periodic tables that are perfect for testing your child’s knowledge of the period table. Recommended: Can You Afford to be a Stay-at-home Parent? 2. How Many Pints in a Gallon? Awesome infographic! Again from Five Js. Help your children visualize liquid measurement. Full color. 3. Free Science Lesson Plans from Discovery Education. This one is about weather. The objectives are outlined and there is a materials lists (you do need some supplies, but you can probably substitute the poster board with paper you have on hand and the rest of the supplies are typical homeschool supplies.). The site provides a video and tons of links to help you teach the lesson. 4. All of the “ologies”. Anthropology, zoology, paleontology . . . you get the picture. No matter what “ology” you’re currently teaching or which one your kiddos are seeking more information about, you can find it here. 5. Got a kid with a craving for science how-tos? I know I do! We love videos from Robert Krampf The Happy Scientist.